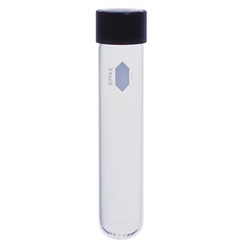 Borosilicate glass tubes, used with tight-sealed screw caps, are suitable for Laboratory Pasteurized Counts (LPC). These tubes can be fully immersed in a water bath and will not leak. Use to test for thermoduric bacteria, a type of microorganism that survives pasteurization but does not grow at pasteurization temperatures. The presence of high numbers of thermoduric bacteria in raw milk usually indicates poorly cleaned and sanitized udders, utensils and milking equipment. Thermoduric organisms can contribute to high Standard Plate Counts (SPC) in pasteurized milk and milk products. The LPC is performed by heating the sample to 62.8º C (145º F) for 30 minutes, followed by a SPC. LPC counts should be less than 250/mL.